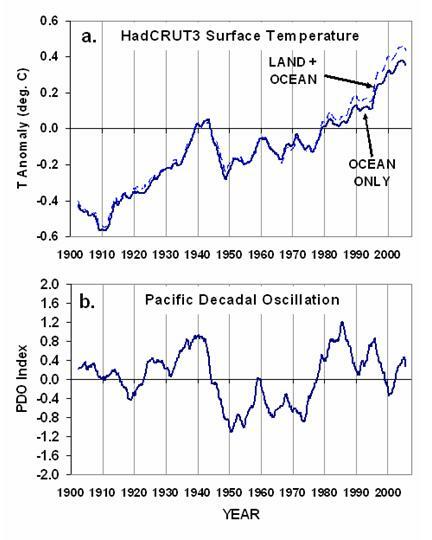 The Temperature & PDO decrease in the 1940s needs to be explained. PDO has since been described as a long-lived El Niño-like pattern of Pacific climate variability because the two climate oscillations have similar spatial climate fingerprints, but very different temporal behavior. Two main characteristics distinguish PDO from El Niño/Southern Oscillation (ENSO): first, 20th century PDO "events" persisted for 20-to-30 years, while typical ENSO events persisted for 6 to 18 months; second, the climatic fingerprints of the PDO are most visible in the North Pacific/North American sector, while secondary signatures exist in the tropics - the opposite is true for ENSO. A ENSO event duration is typically last only about one year. The persistent cooling during the 1940s can not be sufficiently explained on this basis, but should include the impact of naval war on ocean pattern in the Pacific.